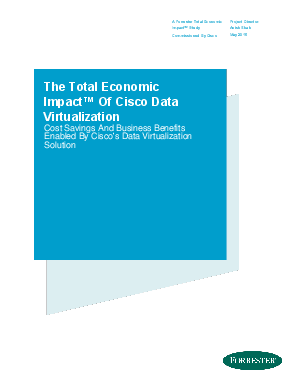 Cisco commissioned Forrester Consulting to conduct a Total Economic Impact™ (TEI) study and examine the potential return on investment (ROI) enterprises may realize by deploying the Cisco Data Virtualization solution. The purpose of this study is to provide readers with a framework to evaluate the potential financial impact of investing in the Cisco Data Virtualization solution for their organizations. To better understand the benefits, costs, and risks associated with Cisco Data Virtualization, Forrester gathered data through interviews with customers who had multiple years’ experience using the solution. All organizations used Cisco Data Virtualization as a single data virtualization integration platform to query and access data across their network. This includes accessing data that resides on the cloud and on-premises across various sources and systems.